Start making plans to join Deb and Dean Mathias and other fellow cyclists for the 2018 QCBC Fall Foliage Ride on the hills in the Mt. Horeb, Wisconsin, area. The Mathias' will drive to Mt. Horeb on Friday, October 12th. The Grumpy Troll is a hub of activity on Friday nights and a great place to meet up with other Fall Foliage cyclists for dinner. Saturday's ride starts at 9:00 a.m. from the Military Ridge Bike Trail parking lot in Mount Horeb and will be 50 to 60 miles. We will have maps and directions. A link to the route on Ride with GPS will be available for interested parties. Schubert's, on Main Street, is a charming old-fashioned soda fountain/restaurant with healthy options and the perfect place to fill up in the morning before setting out to conquer the hills of troll country. A group dinner is planned for Saturday night at Schubert's. Sunday's ride starts at 8:00 a.m. from the same location and will be 40 to 50 miles. 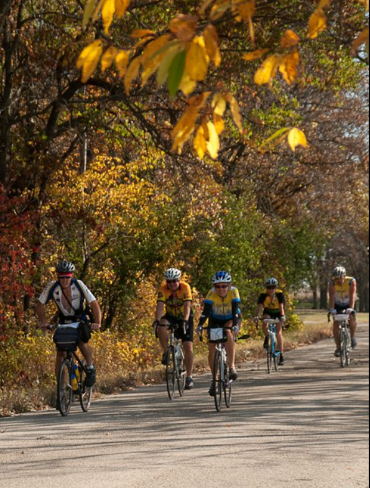 Cycling routes on quiet country roads promise to offer more than a few hills for both days. So keep up your hill training regimen. Each day's ride will be a loop with lunch opportunities at a town midway along the route. Mazomanie on Saturday; New Glarus on Sunday. You will experience spectacular views that are a pleasant change from the corn and bean fields that you have been looking at on your cycling outings all summer. You have an option to ride just one day or both. Travel distance to Mt. Horeb is about 140 miles from Davenport - close enough to drive up and back the same day if you cannot get away for an entire weekend. The Military Ridge Bike Trail (crushed limestone) offers an option for those cyclists that prefer flat terrain. The trail runs west to Governor Dodge State Park and east to Verona and beyond toward Madison. A trail pass is required. Mt. Horeb is known for life-size trolls carved into tree trunks scattered throughout the village. Visitors are encouraged to take a leisurely "Troll Stroll" to seek out these unique characters using the Troll Spotter field guide. Contact Deb and Dean Mathias at 309-737-8429 or mathiasdebdean@peoplepc.com if you plan to join the ride so that we know how many people to expect. Also give us a head count of all individuals that will be joining the group for dinner on Saturday night. Individuals that are not riding are welcome to join us for our group dinner. You are responsible for making your own room reservations. Mt. Horeb can be busy in October so we encourage you to reserve early. Rooms are available at Village Inn Hotel which is physically attached to the Military Ridge Bike Trail - call 608-437-3350. Mention the Quad Cities Bicycle Club. Some Bed and Breakfast facilities are also available in the area. Check out Mt. Horeb's website for more information. Verona also has a number of hotels that are about 10 miles east of Mount Horeb. A number of bed and breakfasts are available in the area. Check out Mt. Horeb's website for other possibilities. Brigham Park - 112 acre park with a spectacular panoramic view about 7 miles west of Mt. Horeb. Blue Mounds State Park about 10 miles west of Mt. Horeb - for information, call 608-437-5711.